Explore what is nearby Bucerias! Bucerias is central to many great villages surrounding the Bay of Banderas, just waiting to be discovered. These villages, most only minutes away and offer more than you can imagine, each distinct in their own way! How grateful we are of the beauty and serene long beaches that surround this area. 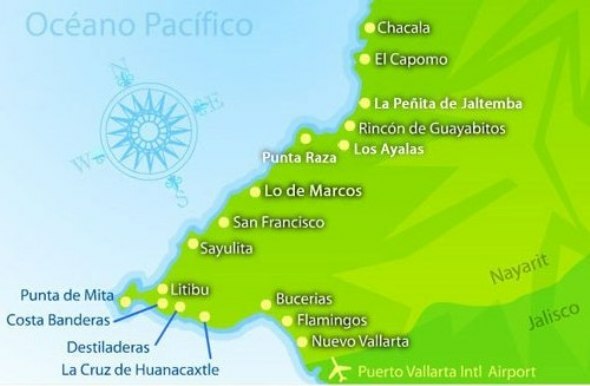 The popularity of the Bay of Banderas has really grown with the major draw of course being Puerto Vallarta. Yet many are not aware of the surrounding areas that boast many experiences that you will need to tap into. Follow the highway going north from PV (Puerto Vallarta) up the coast offers such variety of towns that offer a rich cultural experience. It is our hope that you come see why Riviera Nayarit attracts the greatest number of private investors of any region on the Mexican Pacific, and it continues to be a preferred destination for both national and international tourists alike. As you browse through the following towns, you will get a small sampling of what 290 km's (180 miles) of coastline have to offer. You will be amazed by the endless coastal sites including outdoor adventures, spectacular hotels, picturesque villas, golf courses, marinas, restaurants and immense jungles and mangroves. Above all, the warm transparent blue waters of the ocean will provide an enthusiastic vacation you are looking for. Don't just stay in your hotel - get out and experience Mexico!